They try to answer the question of whether current consumption is sustainable. They consider sustainability to mean that inter-temporal (sum of the discounted value of future) social welfare must not decrease over time. They interpret this to mean that this depends on investment that increases humanity’s productive capacities – which they term genuine wealth. This requirement that the productive base be maintained does not necessarily entail maintaining any particular set of resources at any given time. Even if some resources such as stocks of minerals are drawn down along a consumption path, the sustainability criterion could nevertheless be satisfied if other capital assets were accumulated sufficiently to offset the resource decline. 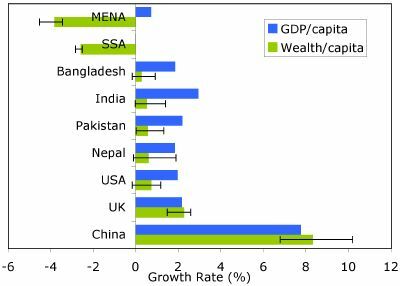 Figure comparing yearly growth in per capita GDP and Genuine Wealth during 1970-2001. Error bars show how estimates of wealth change in response different estimates of the ratio between wealth and GDP. I created the figure based on data in Tables 2 & 3 of Arrow et al 2004.